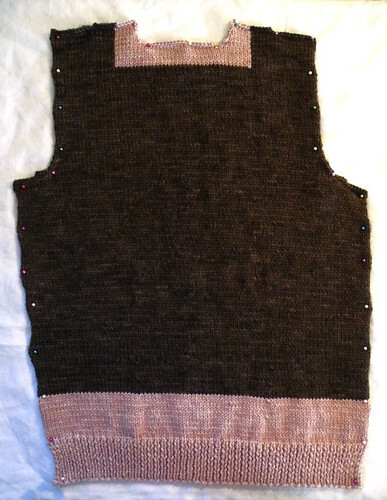 The back of Adelina, the sweater I’m test knitting, was finished in the last minutes of the U.S. vs. Canada hockey game. And I was grateful for it – what a crazy game! My fingernails would have been chewed to bits without it. I was halfway through the last row when Sidney Crosby made his game winning goal. I jumped up, cheered, hugged my husband, and bound off the remaining six stitches. Let’s all cross our fingers that I didn’t mess up the last few inches since my attention was rather divided, ok? And before you ask: yes, I’m an American, and yes, I wanted Canada to win. That country holds a very special place in my heart, and I wanted the gold for them so badly. I’m going to miss the Olympics for a lot of reasons: I thrive on knitting goals, I loved watching the events, it gave me an excuse to ignore housework, and it opened my eyes to sports I knew nothing about but ended up getting really into. Who would have guessed that cross country skiing and curling were so exciting? There is some bad news with Tea Leaves. I am really unhappy with the button bands. The pattern calls for you to pick up three stitches for every four rows, which results in way too many stitches. They ended up oddly shaped – sort of like they were exploding outward. I thought maybe I could block them into submission, but no such luck. They’re definitely going to have to be reknit. Now I have just one question: is it 2012 yet? Can’t wait for the summer games in London! I know what you mean! I’m going through Olympic withdraw. What do I watch now?! I turn the tv on and there is real programing?! Give me more Olympics! So, when you do a test knit for someone do you get to keep the sweater? Have been trying unsuccessfully past 2 weeks to download Multnomah shawl pattern. Tells me document is damaged. I have successfully downloaded others to my Adobe, so think it’s your document. Help. I’d really like to get Multnomah, it looks so lovely and like something I can attempt for my first “lace” shawl. Yes, Seattle is a lovely city and fun to visit. Not sure I’d want to live there. I’m just outside Vancouver, WA and that’s just big enough for me.